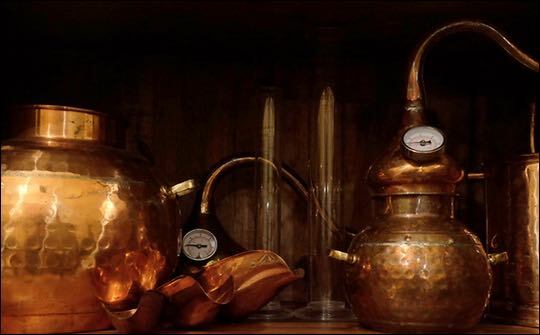 Gin distilling is expected to start in Hertfordshire for the first time when Puddingstone Distillery opens its doors next year. Local business couple Kate and Ben Marston (pictured) are running a crowdfunding campaign to assist in establishing their distillery in Wilstone near Tring and the launch of Campfire Gin, dubbed ‘the Spirit of the Outdoors’. Campfire will initially be available as a bold 42% London Dry version followed by Navy Strength and cask aged varieties, while plans for seasonal gins, sourcing local botanicals, are also in place. Crowdfunders in Puddingstone Distillery will get their hands on a first batch bottle of Campfire Gin made in the Chiltern Hills in 2016. Designers are curently working on the branding, the bottle and label. Pictured: The small still that is to be replaced when they go into production.